When my family was here, I made tons of calorie rich food, no really look at this and this and there was more which never made it to the blog. And as a result of this indulgence (read: over indulgence) I have put on few pounds! Urgh I so hate it when my jeans starts to get tighter. Anyway now in order to get back on track I am trying to eat salads for dinner. I am still eating my desserts and exercise is one thing which I always do, so that is there but now I am deliberately trying to add in more salads to my diet. The good thing about salads is that they are so easy to make. There’s hardly any cooking, they are nutritious and also very filling. 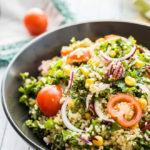 One of my favorite ingredient to add to my salads is quinoa, yes the super food! I really like quinoa but I don’t cook it often and I don’t know why. Maybe because hubby can’t stand it and I am lazy to cook it all for myself. When my parents were here, I made this quinoa salad with almonds and they loved it so much. That was the first time they tasted quinoa and they liked it so much that they took a big pack of it from Costco with them. I made this quinoa chickpea salad the other day when I really wanted to have something quick and healthy. And since I had some mangoes in my refrigerator it only made sense to add them to the salad. This salad tastes great when it’s a little chilled. So I would recommend keeping it in the refrigerator for 20-25 minutes before serving. 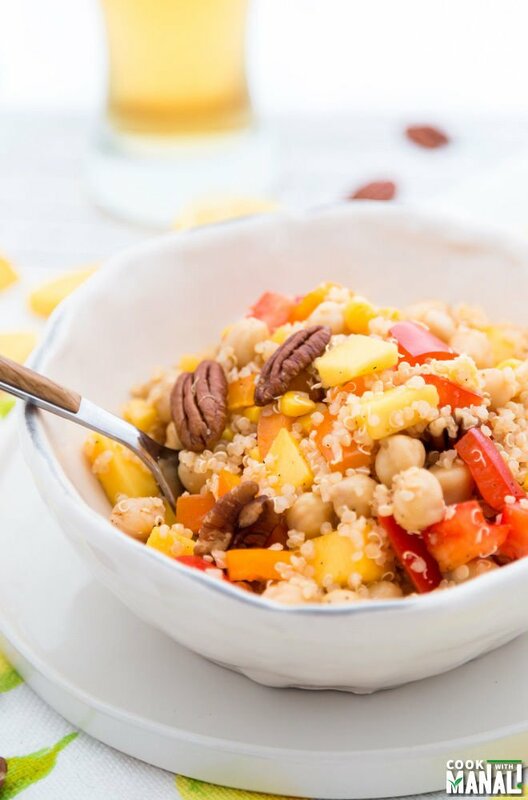 Topped with toasted pecans, this quinoa chickpea mango salad is also vegan. And guys I have something else to talk about as well. I have decided to join Yummly as a publisher. Do you guys use it? If not I highly recommend it. On Yummly you can see recipes that you like, based on your preference! And that’s not all you can save all your favorite recipes in your recipe box on Yummly. I think that’s so amazing that all the recipes that you want to try can now be stored at one place! 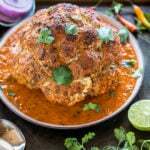 To find all recipes from Cook With Manali on Yummly click here. 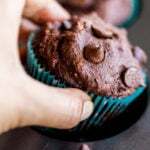 So join today and start to yum your favorite recipes. 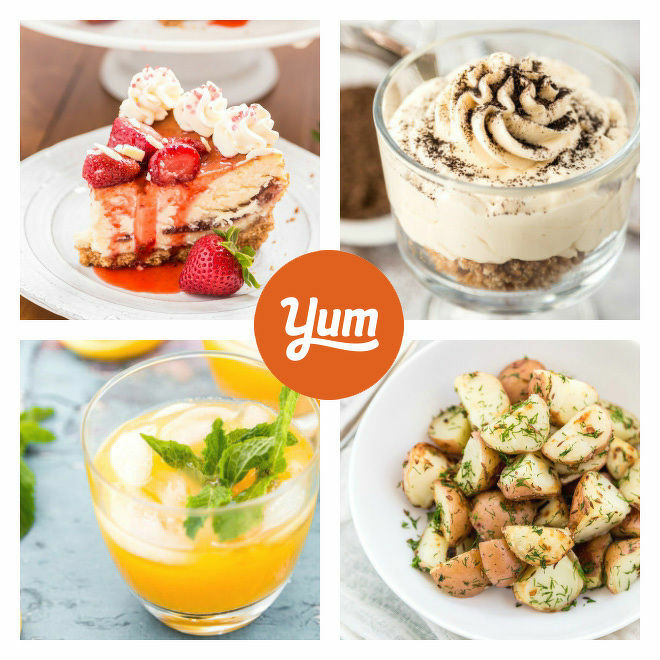 To yum a recipe, just click on the “yum logo” that you see in the side bar! Looking for more healthy salad recipes? Check these out! * Cooking time is the time required to cook quinoa. * You can add some honey or maple syrup to your salad dressing if you want. 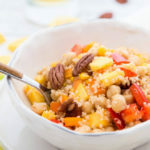 Quinoa Chickpea Salad with Mango, Corn & Pecans. Easy and healthy! Cook quinoa according to instructions on the package. Set aside. Boil the chickpeas or use 1 cup canned chickpeas. Roast the pecans in a pan until fragrant, around 5-6 minutes. You can also roast them in the oven. 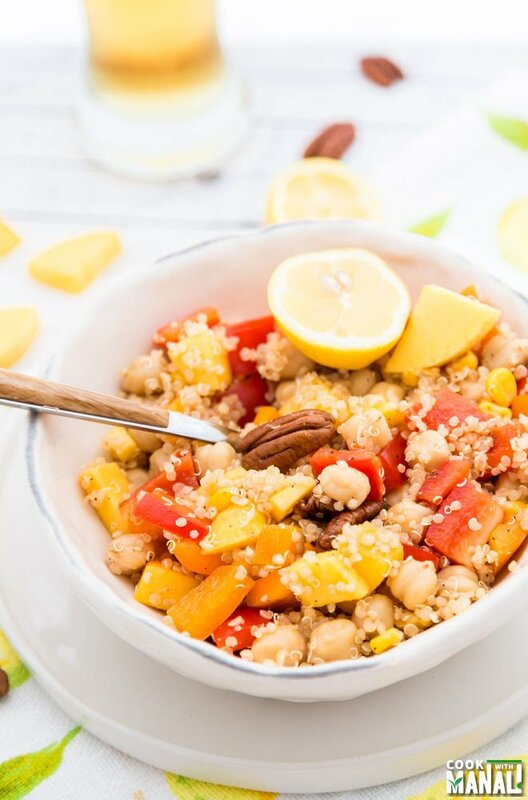 In a large bowl mix together quinoa, chickpeas, mango cubes, sweet corn, red pepper, orange pepper. Set aside. In a mason jar, add all the ingredients listed under "dressing". Close the jar and shake it till everything is well combined. Pour the dressing over the salad. Mix till combined. Top with roasted pecans, cover and chill the salad bowl for at least 20 minutes before serving! 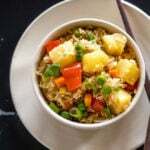 Quinoa and chickpeas are two of my favorites! Love how you combined them in this salad, Manali! And the mango sounds like the perfect touch. What a flavorful meal! I love that you have aded some pecans to this. One of my favourite crunchy additions to salads. Thanks David! it was really good! What a lovely looking refreshing and healthy salad, Manali! Me too! Mango was a great addition! Thanks Harriet! This salad looks amazing, Manali! Love the pecans and mango in it! Sounds so healthy and delicious! Thanks Jen! it was good! You have two of my favorite ingredients here…chickpeas and quinoa. 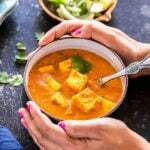 This recipe is a keeper, Manali! Plus – I love how bright it is! Thanks Annie! yes bright and refreshing, just like summer! This is such a pretty salad, Manali! 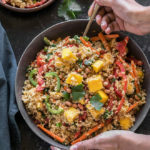 I love the chickpeas and quinoa in here and anything with mango totally has my heart 🙂 So bright, healthy and delicious! Such a beautiful and nutritious salad! Can’t believe we both posted about chickpeas today 🙂 Quinoa with chickpeas is sure a delicious combination! I can taste how delicious this salad will be! Thanks for sharing, Manali! loving it! Yeah it’s chickpeas day today! lol Thanks dear! Girl, do I ever relate to you with the weight gain. Pants too tight is no bueno. This salad, however, looks muy bueno. I’m really digging the mango in here with the quinoa. I’ve never tried that and it sounds fantastic! Hope you give it a try! 🙂 Thank you dear! Yum! This salad looks amazing! I love quinoa in anything, and I am also a BIG fan of chickpeas!! yeah quinoa is awesome! Thanks Annie! This looks like a delicious way to get back on track eating-wise after company! 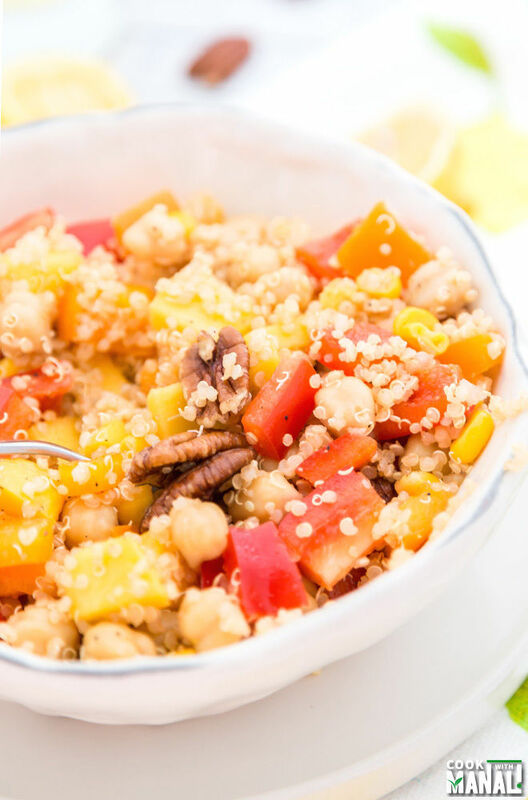 The mango, peppers, and pecans with the chickpeas sound like a great combination — pinned! I’m the same way with quinoa – I’m the only one in the house that likes it and I just never really feel it’s worth making for just me. But I definitely should more often! 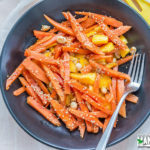 This salad looks great, I love the mango in it! I know, it’s tough making something only for yourself! Gone are the days when one used to synonym salad with boring.. I agree, anything with mango is always a winner! This salad looks beautiful! Love quinoa! Will definitely try it, love quinoa! Yay for vegan salads! 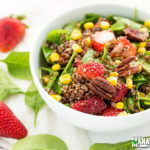 I love grain salads and this looks delicious. Mango is the best! I also love your philosophy of not flash dieting, but just trying to eat a salad a day 🙂 Awesome! haha medha i can’t live without desserts so that philosophy works for me 😛 Thank you! Oh, yes please! I love the sweet and spice together, yummers! HiHello Manali, how are you going? It’s been ages since I last posted in my blog, I’ve been away from the online world for quite some time which is a shame really! Great to see another of your delicious recipes, can’t beat a salad with chunky pieces of mango! Mango season is around the corner here in Australia, so this is one I am saving to try as soon as mangoes are available! Hello dear, so good to see you!! Where have u been? You were missed in the blogging world, hope to see new recipes from you soon!! Hi dear, thanks for asking. To cut the long story short, I moved houses and started working full time a few months ago all at once Only now things are starting to settle down. I am looking forward to getting back! Nice talking to you, have a great day!